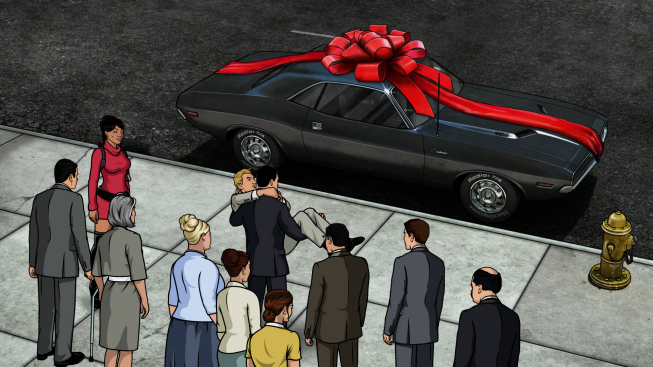 The Talking Box: Archer - "Drift Problem"
Kreger introduces Archer to his new spy car and all of its features. [Best feature: chilled decanters in the glove box!] Archer wrecks the bar immediately by forgetting to close it. As Archer takes it for a test drive and tries to apologize to the voice in the car, he uses the car's spy features to get rid of cops. Then, he heads upstairs to make Woodhouse clean the mess out of the car. By the time he reaches the garage, the car's gone. Archer decides he has to go undercover in the 'high-end car thief underworld' to steal back the car. While asking Lana for help in the women's bathroom, Pam and Carol are in the stalls. Pam apparently runs underground races with the Yakuza [whys they always gotta be Asian???] and clues them into the details. Lana agrees to help and he narrowing avoids Mallory discovering the secret. At the race, the ISIS's team disguise doesn't last long as Archer disrespects the main boss, gets beaten up, and pulls machine guns on the crowd in about 5 seconds. Carol is watching on her phone when Mallory literally slaps the truth out of her. [PS: she likes it...] At the same time, Archer confesses the story and the boss reveals they only sell drift cars. While Archer stumbles through some kind of excuse, Pam jumps into her car and drives them all out of there with the Yakuza following them. Drifting around corners, Pam destroys all the Yakuza cars and knocks the boss into the water. Mallory and Carol show up and it's revealed Archer's mom stole his bike when he was 5 because he left it out unwatched (and she never gave it back), and now she stole his new car. Archer walks off in disbelief... Mallory already sold the car to a creepy black guy. -Archer: "It makes the Mach 5 look like a vag!na." -Mallory: "Who the hell taught you to drive?" Carol: "It's this guy I know, called MY DEAD FATHER... Yeah, I bet you feel like a d!ck."